It may be a good idea to copy your DVD Movie collection to a hard drive in case of damage or theft. In order to save your DVD collection you must first know how to copy a DVD movie. In this page, we will give you the solution to directly copying main movie from a DVD disc without extras to take up space. Looking to liberate the movies in your DVD collection from the confines of their plastic-and-metal prison, what you need is a yet professional DVD Ripping software. Brorsoft DVD Ripper comes here. This DVD Ripper enables user to copy DVD movie in a flexible and simple way. 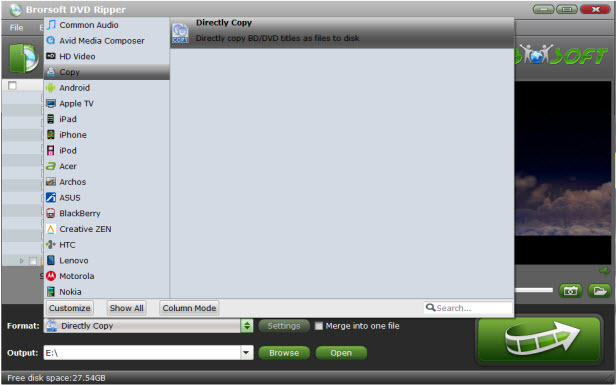 With it, you can copy the main movie only from a DVD and leave out unwanted menus or other extras. Except backing up DVD movies on your hard drive, you can also use it to rip and convert DVD movies to any format you want or any tablet, smartphone or HD media players with optimized video formats. If you wanna make a full disc copy, please turn to how to backup a DVD with original structures. Launch the DVD Ripper and click "Load file(s)" to load original DVD discs. Click "Format" bar, choose "Copy" > "Directly Copy" from the Format menu to copy the . vob files only which contains the main movie on your DVD disc. Finally, click "Convert" button to start lossless DVD Backup for Main Movie. When the copying work is done, you are able to click "Open" button to get the output .vob files without any other extra contents. Besides ripping DVD, Handbrake is a good tool to rip and convert videos, Blu-rays. If Handbrake won't work any more on macOS Sierra to help you do BD/DVD ripping/copying, you can turn to Brorsoft iMedia Converter for Mac, which is an all-in-one alternative tool for Handbrake. It enables you to easily convert videos, rip DVDs, Blu-ray movies on macOS Sierra with the best quality.